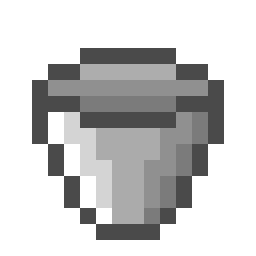 Difference between revisions of "Bucket"
A bucket is an item that will carry a liquid. Such liquids are milk, lava, water, and acid. To obtain a milk bucket, the player may shift-click on a cow with a bucket. To obtain other liquids, the player can shift-click the source block of the liquid. To place the liquid back down, the player only needs to shift-click the bucket again. Buckets are really useful as you can carry liquids in them. A milk bucket can be used to craft a cake. A lava bucket can be used as a long-lasting fuel which lasts ten times longer than coal and charcoal. A water bucket can be used to empty the water in a hole and farm in the adjecant blocks.